Preheat oven to 300 degrees Fahrenheit. Wash kale leaves and dry very well. Using a paring knife or kitchen scissors, trim out the ribs and discard. Cut the remaining kale into approximately two-inch pieces. Place kale in a large bowl and toss gently but thoroughly, making sure that every last bit of kale leave is coated with olive oil. Line a large baking sheet with parchment paper. 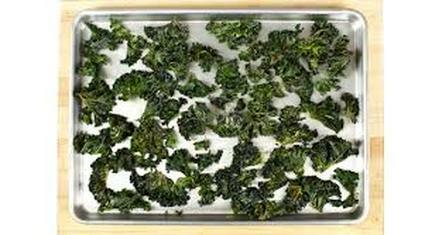 Lay kale in a single layer on the baking sheet and sprinkle with sea salt. (If you have more kale than baking sheet, you may need to cook them in batches). Bake for 8 – 12 minutes, just until crisp. Start checking at 8 minutes – don’t overcook or they’ll burn! Remove from oven and let cool for a minute or two, then serve.